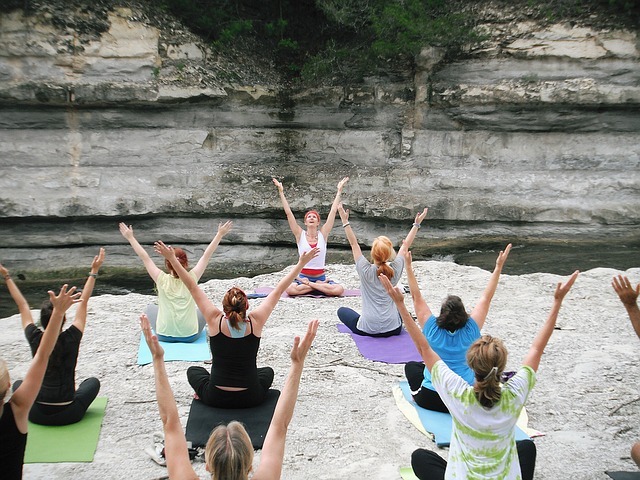 Is Yoga the perfect form of exercise and relaxation? Let’s make a list of what our ideal type of exercise would be and go from there. First, it would be simple enough that anyone could do it, but have enough variations and different methods that it would maintain the interest of someone who had been practicing it for years. It would need to be easy to learn so that people could pick up the basics quickly and stat seeing the benefits as soon as possible. To be a perfect form of exercise it would need to be capable of keep our body in good shape all by itself. It would help with weight loss, circulation and increasing the strength of the muscles. It would stimulate the lymphatic system as well as the blood flow and help the body dispose of waste products, improving the overall immune response system. It would also have benefits that went beyond health – the sharpening of the mind and an increased sense of well being and contentment. Ideally it would be an exercise form that required no expensive equipment and that could be practiced practically anywhere, alone or in a group. This is quite a demanding set of prerequisites for a perfect form of exercise. Let’s see if Yoga measures up to these standards. Yoga is a discipline that has it’s routes in India. The documents that modern Yoga is based on are hundreds of years old, and the principles behind these documents were practiced long before that. It is a low impact form of exercise that has been tweaked and customized by literally thousands of different teachers and enthusiasts. The are numerous resulting ‘styles’ of Yoga, but they all have the same core background and beliefs. What we refer to as Yoga in the West is usually the physical component of an entire life philosophy that has it’s own beliefs and code of ethics built in. The physical focus of Yoga is on poses and slow movements that are low impact and usually use nothing more than our own body. Sometimes props and supports are used to assist the body in achieving and holding a particular pose. The poses can vary greatly in their degree of difficulty and even the same pose can have many different stages or levels. The perfect example is a simple forward stretch. One person may be able to stretch out past their knees, another may be able to reach their ankles and somebody else may be able to touch the floor. This level of progression allows us to see a physical difference in our flexibility level as we practice Yoga more regularly. And because Yoga does not require any special equipment we are not refined to set class times and can practice Yoga anywhere and any time the fancy takes us. We can even do breathing exercises to clear the mind while sitting at a work desk. Yoga has some incredible health benefits which stem from controlled breathing and increased blood flow. Our bodies organs simply do not operate at peak efficiency unless they are receiving the oxygen and nutrients that they need. The waste products from our muscles and organs are carried away by the lymphatic system. Both systems can develop chokepoints and blockages that different Yoga poses will address and correct. The result is a better more regular blood pressure, a more efficient immunity system and a optimal digestive process. Because Yoga movements are slow and simple, the focus on correct breathing has a pronounced mental affect on the body. It provides us with an enhanced ability to focus, and to un-clutter our thoughts. This is a valuable edge in modern life and its importance should not be under estimated. Finally, many regular Yoga enthusiasts will tell you that there is a spiritual side to Yoga, how far this affects an individual will probably depend on their beliefs before they begin practicing Yoga, but it can perhaps be thought of most accurately with a greater comfort and connection with your own body. The increased acceptance of yourself, and comfort with your own being results directly in more happy people. Well there you have it! All the boxes on the list are checked. If you have not experienced Yoga, I definitely recommend it. You have so much you will be able to gain.